I love busy weekends. I am still trying to find a reasonably priced rabies vaccine, if anyone has any ideas....I am open to suggestions. Lots going on at the farm. 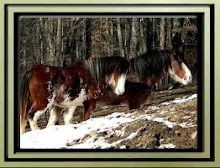 From my last blog, you know that I sold the Clydesdale Trailer and bought a smaller bumper pulled trailer that would be easier for doing animal rescue work. The old trailer was great for hauling a lot of animals at once but it was so big that it made it very difficult to get in and out of tight spots and driveways. On friday, I was home from school with 2 (of 3) sick kids. While Colin and Buddy started taping and getting the apartment ready to paint I took a quick ride to the trailer place to get the "new" trailer. Wow, expensive to haul animals around. I sold my trailer for a lot less than I should have but I did what was practical for rescues. The only color that they had left in stock was fire engine red, I hated the color as I trudged home with it following the truck but it is starting to grow on me. I think that if we have New York Wildlife Rescue Center painted on the side of it that it will look very "offical" and less like a home for a family of gypsies. I spent most of the weekend painting the apartment. I am a very driven person, when I make up my mind that something is going to be done....It is going to be done. It took 36 hours of my time but there were 4 of us painting at a couple of different times over the weekend, I hate to think of how long it would have taken me alone . Good job done. In an effort to finish the money pit, I have decided today that I am going to sell my youngest (and one of my favorite) Clydes to a great friend in Mass.. The ending of an era continues. I will be left with my 3 old guys and in a year or two, most of those guys will probably be gone. It upsets me to think about all of the carriages, horses, etc.. and how much I love all of it but if I am going to focus on animal rescue, I need to make sacrifices. 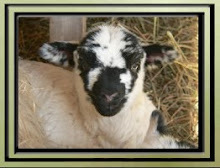 Yesterday was a very busy day for rescues and I never even left the farm. Due to a foreclosure, I had some really great folks bring me 2 potbelly pigs, 2 rabbits, 6 chickens and 4 geese. I chuckled as I watched their mini van pull in the driveway. 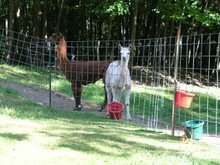 Knowing that there van would be a lot worse with geese and pigs in it that my wifes was last weekend with two llamas in it. 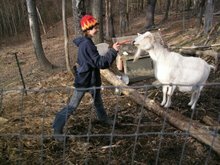 I think that there will be a lot more animals (and people) affected by foreclosures before we get out of the recession that we are stuck in. I wasnt answering the phone as I was working around the farm but for some reason I did once. A woman that lives in Blenhiem, NY had a female Downy Woodpecker hit her garage door window. She really did everything right. She observed it for a couple of hours at a distance while making sure a cat didnt get it. She brought it in the house when she realized it was messed up pretty good. 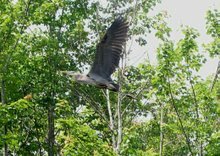 Quite often if left alone for a couple of hours, they will "get it back together" and fly off. This little thing has a head issue but it has an appetite for suet and has made it for 2 days and 2 nights. A good sign since most usually die of head trauma and stress within the first 12-24 hours. I asked if she could run it down to me, which they did and I appreciate. I consulted a friend who specializes in birds. I think that it is going to be a time factor case. As long as we keep her eating suet, peanutbutter, and all sorts of treats she stands a 50/50 chance at the moment. Woodpeckers also require a rope, rough log or a vertical perch. I thought that the Barred Owl had a great chance (he died that night of head trama) while he was being held in observation at another rehabbers house that specializes in Birds of Prey. I wish that I could report back a happy ending on that case. I would like to see the woodpecker make it. I know that a good percentage of rescued wildlife dont make it but this one appears tough. I will definately keep everyone updated on its progress. Hi Folks, not much new here in the last couple of weeks. I know that it has been awhile since Ive blogged so I thought that I would catch everyone up on what Ive been doing the last couple of weeks. 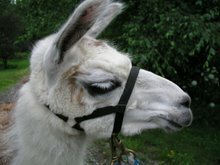 I had a great llama come in from a nice couple that Ive known for a long time. He needs to be gelded but he is halter broke and very adoptable (eventually). He has the coolest eyes that Ive ever seen on a llama. He has blue highlights on his brown eyes. 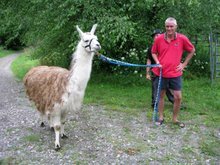 Very cool llama and I thank his owners for bringing him up and for their continued support for what we do up here. 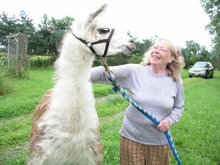 I got a call the beginning of the week from another woman that has adopted llamas from us in the past. She is getting a divorce and needed me to pick up a couple of llamas. This is where things get interesting. On sat. AM I sold the huge alumin. gooseneck trailer that Ive had for the last 5 years. As I cont. to downsize with my draft horses. I really dont need a 22 foot long trailer to do rescue work. My trailer is really too big to get into peoples driveways. I am going to get a smaller trailer that will be better for rescue work. 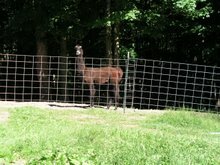 By 9 am my trailer was going down the driveway and I was trying to figure out how we were going to get two llama back here. 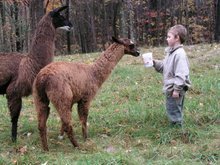 As I stood in the driveway looking at my wife's mini van I got the idea.....well you know where this is going....Before she realized what I was doing, I had the back seats removed and off I went to pick up the two llamas that needed to come back to the farm. Hauling llamas in a car, minivan, truck with a cap, etc. is not a new idea. Ive done it for years but this mini van hadnt been "soiled" yet...I arrived at Julie's house and we caught the llamas, I was feeling confident that I was going to give a good show on Llama Transportation 101....As usual, nothing is ever easy and the llamas had other ideas and didnt hop in the back of the van like I thought that they would. Actually they parked their feet, put their ears back and looked at the mini van as if it were the entrance to hell. I rolled my eyes and said ok, lets do it the hard way.....upon which they started spitting all over the inside of my wifes mini van much to my displeasure. I eventually got them in, the spitting continued as we made our departure and I rolled down the windows to keep from gagging on the smell. 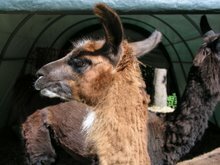 Both llamas eventually laid down in a kush and (from all the spitting) drooled all over the van for the next half an hour until we got back to the farm. Just when you think that you understand llamas, they do something that is completely unexplainable. The same mini van that was now redecorated with green blobs of spit wasnt so bad. When we got back to the farm they refused to get out for almost 20 minutes....Llamas, go figure....The funniest part of the whole trip was watching peoples expressions in cars following us....I really need to get a new trailer...and soon.